A couple of days ago a couple of Ethiopian boys I’m friends with came up to me all excited, they asked me if I’d like to see their home. We walked together for a couple of minutes before we reached a group of tents, some friendly faces and a more forest like area. There was an entrance deeper into more trees and as soon as you entered you could see more shelter like shapes, clusters of plastic and sleeping bags lined up in a row. The deeper you went the more tents you found and always smiling faces were peering out, welcoming you, and jokingly asking ‘would you prefer tea or coffee’. I sat and played a game of cards with some of these young men, they told me that the police know where they are and every night they get no rest, they are continuously tear gassed and pepper sprayed, scared of what the next day will bring. 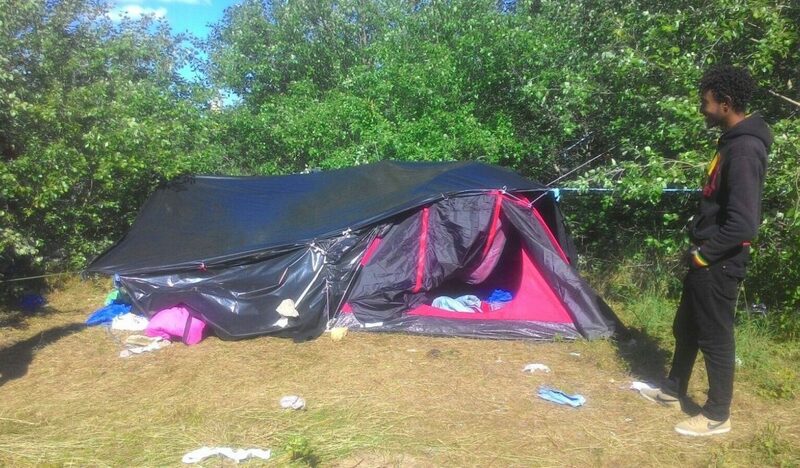 A couple of nights ago the police went into these woods on a mission, a mission to destroy the beginnings of a new jungle in Calais, throwing belongings out of tents and slashing tents and sleeping bags, leaving people cold, damp and sleepless. Today when I went to meet them I saw the remains of the broken community and the glimmer of hope of some sanity and normality for them. They where what once lived, and I met women cheerfully listening to music, continuing their positivity, I could see the attempt to piece their old homes together with old slashed tents hanging off of trees, attempting some sort of shelter from the rain and cold that the nights bring. We desperately need donations; tarpaulins, sleeping bags and small clothes, to give these people some protection from the damp and the cold, so they have at least a little peace of mind. I wish I could donate empathy to the French police. If it were possible I would give them understanding and love, but I can’t and they don’t seem to have it.